Found one file extension association related to FRSGiftRegistry and 1 file format developed specifically for use with FRSGiftRegistry. 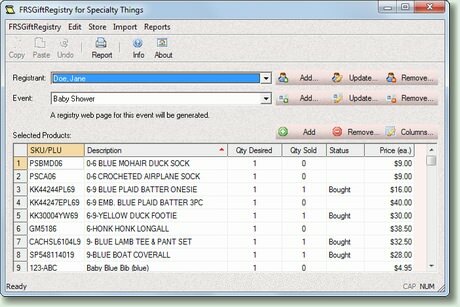 FRSGiftRegistry is a software application for managing your retail store's gift registries. A registry is a document maintained by the store. It lists a person's name, his or her event date, and a collection of products that the person would like to receive on or before that event. Such a person is typically referred to as a "registrant". A store may have its own type of gift registries, but typical ones are for baby showers, bridal showers, house-warming parties, or any other special occasion. If you need more information please contact the developers of FRSGiftRegistry (Fourth Ray Software), or check out their product website.